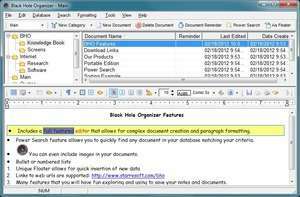 Black Hole Organizer is a web enabled free-form notes application that's been designed to make document management easier. Find notes quickly with Power Search! Create categories and sub-categories (folders) that are meaningful to you. Quickly insert stock text into any note using the template feature! Black Hole Organizer 3.30 is a shareware program and can be used as a demo to try the software until the free trial period has ended. A full version of the program is available after the trial period ends. For security reasons, you should also check out the Black Hole Organizer download at LO4D.com which includes virus and malware tests. Additional screenshots of this application download may be available, too.